Material-handling equipment is equipment that relate to the movement, storage, control and protection of materials, goods and products throughout the process of manufacturing, distribution, consumption and disposal. 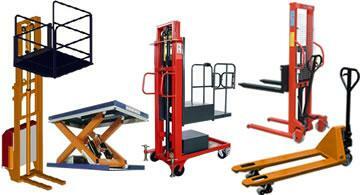 We, at DTPL are manufacturer and suppliers of heavy duty material handling equipment for all your need of material Handling.Giraffe Material Handling Equipments, has come a long way in establishing itself as a market leader, meeting the ever-changing needs of clientele through continuous up gradation of products and their features. Material handling equipment is used to increase output, control costs, and maximize productivity in a storage and racking system.It is the mechanical equipment involved in the complete system. Material handling equipment is generally separated into four main categories: storage and handling equipment, engineered systems, industrial trucks, and bulk material handling.